Dimensions 1.75 by 9 by 11.25 in. Integrated throughout the text are real-world applications that emphasize the relevance of thermodynamics principles to some of the most critical problems and issues of today, including a wealth of coverage of topics related to energy and the environment, biomedical/bioengineering, and emerging technologies. About: Fundamentals of Engineering Thermodynamics, 8th Edition by Moran, Shapiro, Boettner and Bailey continues its tradition of setting the standard for teaching students how to be effective problem solvers. About: This leading text in the field maintains its engaging, readable style while presenting a broader range of applications that motivate engineers to learn the core thermodynamics concepts. About: A comprehensive, best-selling introduction to the basics of engineering thermodynamics. About: Now in a Sixth Edition, Fundamentals of Engineering Thermodynamics maintains its engaging, readable style while presenting a broader range of applications that motivate student understanding of core thermodynamics concepts. 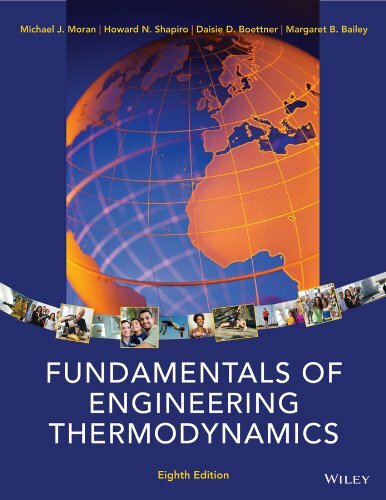 About: Using a classical viewpoint, this Second Edition offers a comprehensive treatment of engineering thermodynamics in order to provide a sound basis for subsequent courses in heat transfer and fluid mechanics and to prepare students to use thermodynamics in professional practice. About: This text is an unbound, binder-ready edition. About: This First Edition of Statistics moves the curriculum in innovative ways while still looking relatively familiar. About: The revision of this market-leading text offers more to students and to faculty. About: Presents a comprehensive and rigorous treatment of the subject from the classical perspective to offer a problem-solving methodology that encourages systematic thinking. About: Fundamentals of Engineering Thermodynamics, 8th Edition Binder Ready VersionÂ by Moran, Shapiro, Boettner and Bailey continues its tradition of setting the standard for teaching students how to be effective problem solvers. 3 edition from John Wiley & Sons Inc (June 1, 1999); titled "Fundamentals of Engineering: Thermodynamics"